Morne Rouge Beach, The Best Grenada Beach? 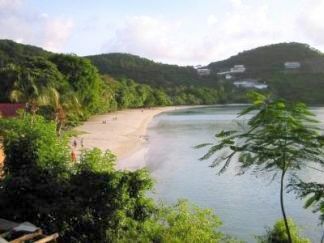 You are here: Home » Blog » Grenada Beaches » Morne Rouge Beach, The Best Grenada Beach? Is Morne Rouge Beach the Best Grenada Beach? I certainly don’t think so. My favorite is Grand Anse Beach. But Many visitors prefer the tranquil turquoise waters, white sand, and natural setting that defines Morne Rouge Beach over all other Grenada Beaches. Morne Rouge Beach, also know as BBC Beach used to be one of the most popular beaches with locals, especially on public holidays. Today it’s still very well know and always gets the thumbs up, but it plays second fiddle to Bathway Beach, on Grenada holidays. of course this can be a big plus in your favor if you are looking for a more quiet relaxing beach experience. Have kids? Then Morne Rouge might definitely be a safer choice over Grand Anse Beach. Tucked away in a bay, this beach is normally quite clam, and great place for the young ones to swim. It is not as accessibly as Grand Anse beach, because unlike it’s sister beach it isn’t close to the main road. If you are already on grand anse beach and want to visit Morne Rouge Beach, then just walk southwards all the way to the end of Grand Anse Beach and go over the hill and you will be right smack on Morne Rouge Beach. If you have a car follow the main road towards Grand Anse Beach, turn down one of the side streets leading to Spice Island Mall, go pass the Mall, continue on the road towards Cinnamon Hill hotel, and that road ends at Morne Rouge Beach. Morne Rouge Beach is smack in the tourist district if we can call it that, so finding proper hotel accommodations is easy. Two of the closest are Gem Holiday Beach Resort, and the Flamboyant hotel. There are many other fine hotels and guest houses within 1 – 2 mile of Morne Rouge Beach, take a look in our hotel accommodations directory to find one that delights you. Looking for nearby restaurants? Grand Anse, True Blue and Lance Aux Pines areas, all are within 3 miles of Morne Rouge Beach, and boasts some of Grenada’s best places to eat. Here are some of my favorite Grenada Restaurants. Also don’t overlook the option of packing a picnic basket for a day on Morne Rouge Beach. I’m sure your hotel will be happy to prepare a basket with some choice goodies just for the beach.